Oil on canvas depicting a rural scene with cows drinking. The artist sent works to the RA from this address in 1816 and 1818. This is possibly Christie's sale, Lugt 17634 22 February 1845 Thomas Dyson Collection. Historical significance: John Burnet (1784-1868)was born in Musselburgh, Edinburghshire. He studied under Leeshman, the teacher of Sir Walter Scott, before being apprenticed for seven years to the engraver Robert Scott. During his apprenticeship the young Burnet also continued to paint and studied under John Graham at the Trustees’ Academy in Edinburgh, where his fellow students included David Wilkie (1785-1841). In 1806 Burnet settled in London and there made contact with his friend Wilkie, who had arrived a year earlier and was enjoying the success of his paintingThe Village Politicians (exhibited at the Royal Academy in 1806). After the peace of 1814 Burnet spent five months in Paris to study masterpieces in the Louvre. In London he worked on projects to produce prints after contemporary artists work as well as painting genre and landscape scenes. These paintings were exhibited mainly at the British institution, although the artist also exhibited at the Royal Academy from 1808. While he worked predominantly producing genre paintings in the style of both his younger brother James Burnet (1787-1816) and David Wilkie, John also produced landscapes like Cows Drinking. 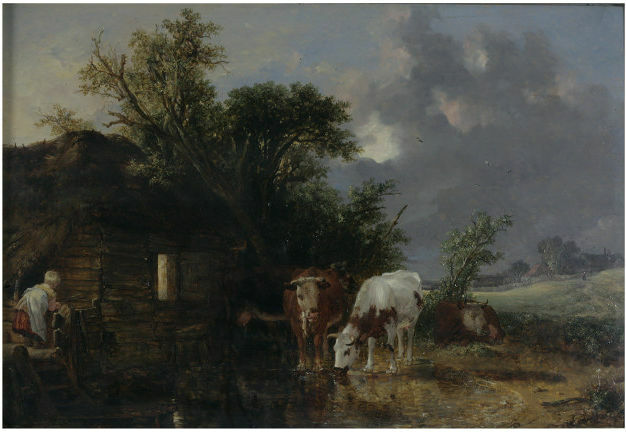 In this painting two cows stand drinking from a pool in the foreground of this painting. The pool is framed on the left by a small wooden house while the landscape opens up to the right of the cows. There is an overall feeling of peace in the painting from the combination of the curving forms of the landscape and the gentle posture of the cows, which have been painted in dark muted tones. Landscapes such as this show reflect those of seventeenth-century Dutch animal painter Aelbert Cuyp (1620-1691), who was highly acclaimed in the early nineteenth century. As with Cuyp’s landscapes, Burnet has placed the cattle in the immediate foreground. The line of a stone wall, built on the ridge of an incline, effectively leads our eyes up to the farmstead in the right distance of the composition. Using the inclines of an otherwise flat landscape for the composition of the Cows Drinking is also employed by Cuyp in his paintings. The contrast of dark tones of the trees and grass against a bright wide sky of clouds also echoes works by the Dutch landscape painter. In the left hand corner a small child has just climbed up the steps to the house and is bending down with a stick in their hand. John Burnet worked mainly producing paintings that were similar to those of his friend David Wilkie. It is generally accepted that his better works were his landscapes. Following the earlier work of Dutch masters like Cuyp they incorporate tone with compositional features including animals, trees and buildings, which reflect the artist’s sensitivity to his surroundings. 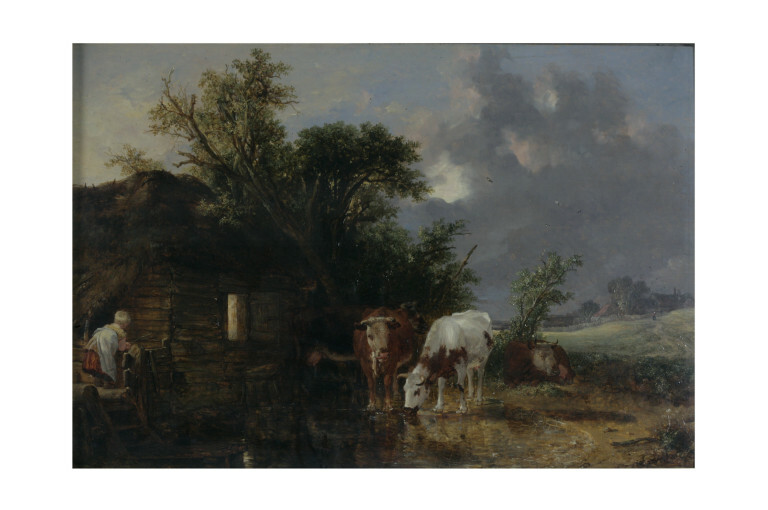 The dates that Burnet was resident at Ebury Street and the label on the back of the painting bearing the title Cattle in a Landscape suggests that FA.6, is no. 264 , exhibited at the British Institution in 1818. All the works exhibited by Burnet at the British Institution all represent cattle. Considering this, it is probable that FA.6 also dates from circa 1818. 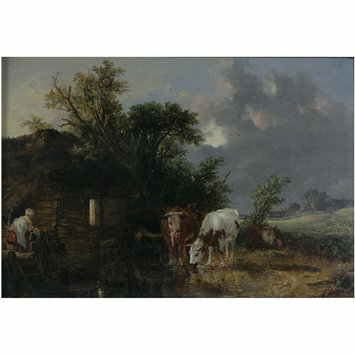 This and another oil by John Burnet Cows drinking (FA.6) were given along with two works by John’s brother James, as part of the John Sheepshanks collection in 1857. Sheepshanks focussed on collecting predominantly contemporary British works. The presence of these works by both John and James Burnet in his collection reflects the regard which contemporaries held for both the Burnet brothers. Oil painting entitled 'Cows Drinking' by John Burnet. Great Britain, 1817.